While mainstream EDM is increasingly driven by soft-synth presets and pre-packaged loops, a funny thing is happening on electronic music’s fringes, as a growing number of musicians immerse themselves in the deeply analog, resolutely DIY world of modular synthesis. Now, a New York festival called Source of Uncertainty will celebrate modular culture with a trade show, the Control Voltage Faire, designed to bring together artists, enthusiasts and developers of the esoteric, recombinant analog devices. An accompanying concert series will celebrate the work of the groundbreaking synth inventor Don Buchla with Morton Subotnick, Alessandro Cortini, Carlos Giffoni, and Mark Verbos all performing on the Buchla 200(e), a mind-bogglingly complex array of knobs, LEDs and patch cords. For those unfamiliar with the technology, a rough analogy: modulars are to conventional synthesizers, hardware and software both, as homemade craft beers are to your average supermarket six pack. (At the far end of the spectrum, sample packs would be something like Zima.) And, sure, in a decade that’s brought us artisanal pickles and black-market grilled cheese sandwiches, it’s probably not surprising that some musicians have decided that patch cords and potentiometers are sexier than iPads and Ableton. (Heck, even Google demonstrated as much with this week’s “Doodle” honoring analog pioneer Bob Moog.) 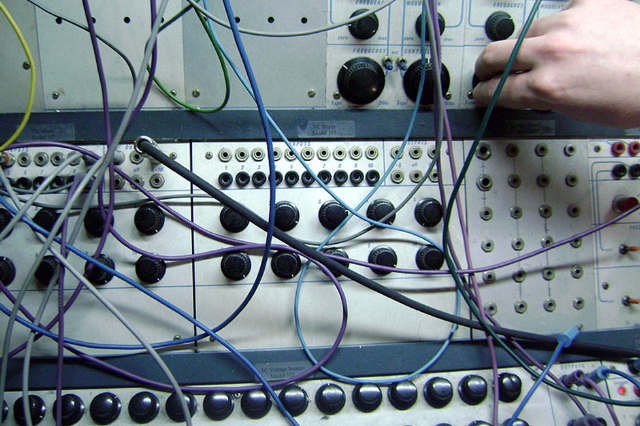 But, as devotees will attest, it’s not just a question of looking cool; as opposed to the hard-wired architectures of conventional synthesizers, modulars, as their name suggests, are designed to be routed in infinite ways, their possibilities constrained only by the imagination and the number of cables in your studio. Source of Uncertainty is a collaborative effort between the New York arts non-profit Harvestworks, the surround-sound festival ((audience)) and the River To River festival. The Control Voltage Faire and the Buchla recital featuring Cortini, Giffoni and Verbos will take place at the South Street Seaport on Thursday, June 28; Subotnick’s concert follows on Saturday, July 7 at Schimmel Arts Center. Admission to all events is free; to help fund the project, organizers are hoping to solicit $7500 in donations to cover artist fees, travel expenses and production costs. To contribute, see the Source of Uncertainty Indiegogo campaign: Donors’ perks include Etudes for the 200e, a compilation of pieces composed for the Buchla 200e, a silk-screened event poster and, for $500, dinner with Morton Subotnick himself.